Should publishers have the right to refuse a manuscript on the basis of seeking retribution for a past wrong? University of Queensland Press (UQP) Publisher Madonna Duffy thought so. Last week she knocked back a proposal for a memoir about the life of the former Queensland premier, Campbell Newman, to be written by former MP Gavin King. One of Newman’s first actions as Premier back in 2012 was to withdraw funding for the Queensland Premier’s Literary Awards. The cuts affected all of the awards, including the David Unaipon Award for Best Indigenous Manuscript, a prize that had been created by UQP. The Queensland community rallied, demonstrating with broad support for the awards that this was to be among the first of Campbell’s unpopular policy moves. They are a publishing house, they are not a political outfit. It’s just an extraordinary political move and to me really petty. Duffy’s response was then expanded upon by UQP board chair Professor Joanne Wright. “The University disagrees in the strongest terms with the reason given [by Duffy] and this has been communicated to UQP management in unambiguous terms,” she said. There were other valid reasons to reject the book, including the likelihood of commercial success. But, is Professor Wright right here? UQP Chief Executive Greg Bain doesn’t think so, saying that Newman had “enraged” colleagues and community. Why shouldn’t a publisher refuse a proposal on political grounds when the author or subject of the book has acted in such a way that they have damaged the publisher? Must they only assess proposals on business grounds? Gavin King himself acknowledged that UQP is “just about the only publisher left in QLD”, without recognising the necessary connection between his former government’s withdrawal of financial and cultural support for the Queensland Premier’s Literary Awards and the health of local publishing houses, including UQP. 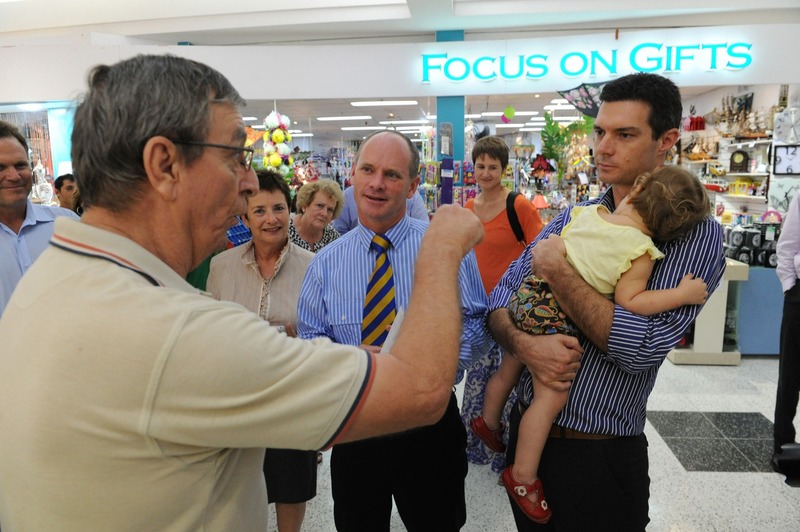 Campbell Newman and Gavin King (right) are accosted by a Cairns resident in 2012. If UQP were to publish Gavin King’s memoir of Campbell Newman, UQP’s own constituency of writers and readers could respond with dismay. Duffy couldn’t have been clearer about this: “It would be both a betrayal to the Queensland literary community and to our own values to publish his memoir,” she reportedly wrote in her email response to King. Certainly, in the Twitter-sphere, support has been clearly on the side of UQP. Potentially, there could be protest, even a boycott. What of its Indigenous writers, whose unique Unpublished Manuscript by an Indigenous Writer David Unaipon Award has been integral to these awards since first being awarded in 1989? The proposed book is not a work by a key political figure, such as former Prime Minister Julia Gillard, who recently published a “tell-all” memoir about her years in parliament from 1998 to 2013, My Story. Campbell’s, by contrast, is a proposed, yet-to-be written, work by a one-term state politician who quickly lost favour with the electorate. A commercial argument would be hard to mount for this proposed work, and one which Bain wasn’t going to support. “Hate reads” don’t fund print-runs. In other recent refusals characterised by political or cultural issues, Spanish publisher Critica cancelled publication of Gregorio Moran’s El cura y los mandarins, on legal grounds. It was advised by its lawyers that a particular chapter could lead to legal action. The author rejected the publishers’ request to alter the text, and Critica withdrew from the contract. A division of Harper Collins US, HarperCollins Christian Publishing, initially refused to publish a work by Christian author Dawn Bennett on the grounds that the work did not condemn her daughter’s homosexuality. Hearing of the public petition against its imprint, Harper Collins US then directed the Christian publisher to go ahead with the book, and provided Bennett with a public apology. Dawn Bennett’s contracted book centres on her role as a Christian mother of a lesbian daughter; and aims to counter homophobia in the Christian community. This censorship is different in kind to that of Duffy’s refusal to publish Newman. HarperCollins Christian Publishing sought to directly censor the views of the writer and to change the truth of her experience as a mother. UQP did not want to engage with the author, whatever his views or conclusions might be. The relationship between author and publisher is one that demands trust. The publisher, editor and others work closely with the author to complete the work and bring it to its readership. Newman condemned himself to being published outside of Queensland when he axed the Awards. Perhaps his future memoir will reflect on this with the benefit of hindsight. My article was originally published on The Conversation. Posted in The Writerly Reader blog. Bookmark the permalink. Listening parties, the new thang. Should authors Rushdie to judgment as book reviewers?